Only last night, as I was driving him home, a friend was telling me how a neighbour’s child had been found playing with a snake. He thought it was a fish! Tonight the same friend started telling me the classic fisherman’s tale. 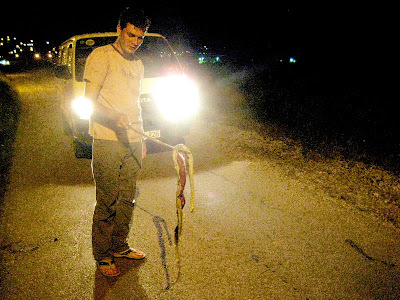 He had seen a dead snake by his house and it was at least a metre long. Honest! As we got closer to his house we decided to try and spot it, assuming that the neighbour’s kid hadn’t got there first. We found it. It was well squashed around the middle but I think you’ll agree it is at least as long as he claimed!